SAN DIEGO, CA--(Marketwired - Apr 17, 2017) - One lucky Club Barona member won a $106,796.98 Royal Flush Progressive Jackpot at Barona Resort & Casino over Easter weekend. 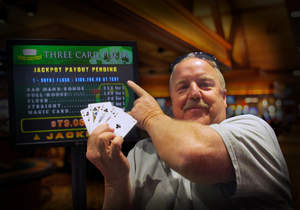 Club Barona member David W., a San Diego resident, was playing Three Card Poker on Friday night when he was dealt a Royal Flush of a 10, Jack, Queen, King and Ace of Clubs. His $5 bet won him the biggest jackpot of the day. "Major jackpots like this are the reason that Barona has been named San Diego's best casino time and again," said Rick Salinas, general manager of Barona Resort & Casino. "We are thrilled every time a loyal player hits it big." Named Best Casino and "Loosest Slots" for six consecutive years in the San Diego's Best Union-Tribune Readers Poll, Barona Resort & Casino is the ultimate gaming entertainment destination featuring 2,100 slot and video poker machines and over 90 table games. The AAA Four Diamond rated property features 400 spacious guest rooms and suites with beautiful views of Barona Valley, award-winning dining, the AmBience Day Spa, a full-service events center and the 18-hole championship Barona Creek Golf Club, ranked in the Golfweek Magazine Top 10 for the past 16 years. For Barona Resort & Casino reservations and information, visit www.barona.com, or call toll free 888-7-BARONA (722-7662). You can also socialize with Barona on Facebook, Twitter, Instagram and YouTube. Barona Resort & Casino Progressive Jackpot winner David W.